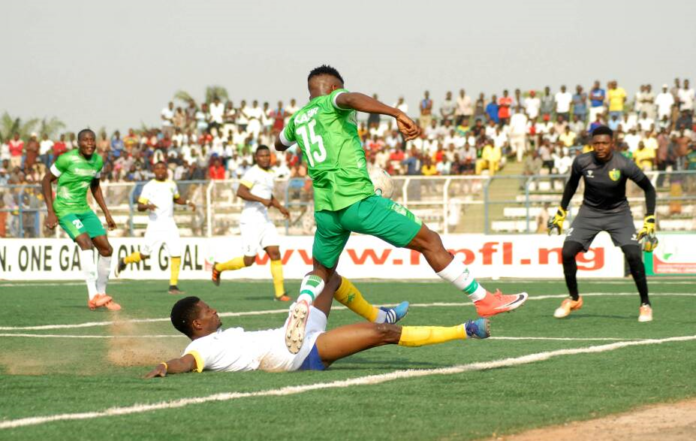 The reigning Nigeria Professional Football League (NPFL) champions, Plateau United have begun their continental journey in the CAF Champions League on a brilliant note. The Jos-based club was in blistering form in the first leg of their preliminary stage tie against Eding Sport; with a comfortable 3-0 win over the visiting Cameroonian club on Sunday. It was Elijah Ogene that broke the deadlock in the 20th minute when the rebound from Tosin Omoyele’s penalty for a handball was smashed in but shockingly, that was whatever they could boast of all through the first half. Almost no change until the point that the dying minutes of the game which Plateau United could get two quick goals as Sunday Ingbede made it 2-0 for the hosts in the 86th minute. While, Joshua Obaje completed a comfortable home win for Plateau United on the stroke of full time. .
Eding Sport played this game without their coach, who reportedly stayed away in protest over team selection by his club bosses.